In certain scenes in The Glass Wives, Evie and her friends Beth and Laney drink coffee at Evie’s kitchen counter. Nicole, on the other hand, drinks tea. And yes, I know the cover isn’t literal, but I can’t help it…I like a little literal now and then, and there is both literal and metaphorical meaning in this cover. As there is in the title. But more importantly, what’s in your cup today? Today I had Starbucks Blonde Roast (made at home) which is my weekend coffee (too $$$ for every day). But tonight in my cup I think I’ll take something a little stronger, just to offset the cold and add to the ambience as the dogs and I hunker down for movie night in front of the fire! And yes, this is the final cover, which I just happened to see today as I was poking around on Goodreads! 64 people have added it to their to-read list, and two early readers have given it five stars. I know that opinions vary with all books, but that was a very nice way to start a very cold Saturday! Why the asterisk after Tea Cup? Because technically, based on a few China cup experts I know, these are indeed coffee cups, based on the shape and the absence of a saucer. Not that I needed them to be coffee cups because I’m literal and the characters drink coffee not tea. But I’m just saying. That my friends, is called cover karma. Love the cover, Amy! Congrats again, and enjoy every single second of this exciting time! Can’t wait to read it. I’m not a big tea drinker but had a cranberry-something tea a few weeks ago at a restaurant and can’t find it anywhere. I liked it and would love to have it at home. I only drink coffee in the morning, so finding a decaf tea I like is my latest quest. As if I need another one! Feel better soon! I agree, it’s perfect! 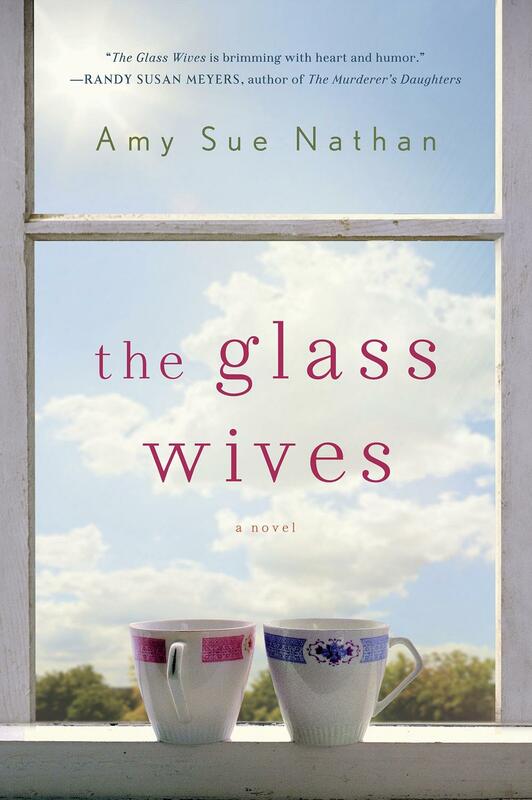 I cannot wait to read The Glass Wives. Bravo for your five-star reviews! Oh, and a latte this morning…vino tonight! I had TWO cups of Twinings Peppermint Tea this morning! such a cold frosty morning and bright tea is so warming! Can’t wait for Glass Wives! I’ve pre-ordered with Amazon! Love the cover! It was a 2-cup morning, huh Nancy? 😉 And thank you for your enthusiasm and support for The Glass Wives!! I’m into English breakfast tea and Darjeeling–then peppermint tea after dinner, with a chocolate on the side to make me get to my desk and write. Congrats on the reviews & the new cover! I am a morning coffee drinker and a morning writer. Thanks for stopping by, Holly!! It’s always fun to see you here. We still need to find time to actually chat! I start the day with hot water and ginger, then hit the espresso around eleven in the morning. And now that it’s cold? Merlot, Nero d’Avola, Malbec – all rich red wines for wintry evenings! It is a beautiful, beautiful cover. I love the cover! I always have. What a beautiful cover! I can’t wait to buy your book. It sounds like a great read. I gave up coffee and tea a long time ago, but I still need a caffeine jolt in the morning. Occasionally,I drink diet Coke in the morning and get lots of stares in the restaurant! Beverly, sometimes Diet Coke in the morning really hits the spot! 😉 Thanks for your kind words! It took me awhile, but i finally found where this is the final cover. I saw your tweet, but didn’t know what to look for. Unsure if 2 pink or one pink, one blue makes a huge difference, I like the look. I’m a coffee drinker!!! Yes, gotta have it! I’ve got the an egalley, and can’t wait to read!! whooohoo!